Nagpur, the center of India, was chosen by Dr. Ambekar as a place for his announcement of being a Buddhist together with his people 49 years ago. Such declaration began the journey seeking for equality and human dignity for the dalit who were the lowest born and the outcaste in the rigid social and religious stratification of Hindu society. The dalit renounced Hinduism to other religions with hope to abandon the status of slavery by birth. Almost half a decade has passed, the plight of the dalits still continued, in spite of new religious identity. Taking the opportunity of the starting of the 50th year of the conversion, the Buddhists from many countries expressed the solidarity and moral support to the Buddhist dalits in the 2005 INEB Conference, which was appropriately titled ?Buddhism and Social Equality? at Nagaloka Campus in Nagpur. ?Transcending Barriers: Dr. Ambedkar and the Buddhist World? 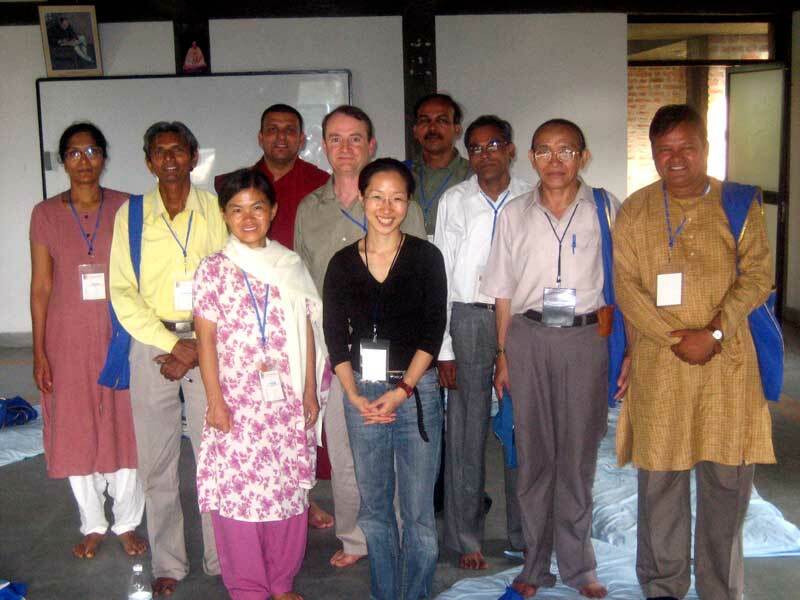 Preceding the main conference, Dhammacari Lokamitra, our host from Jambudvipa Trust, organized pre-conference workshop from 9th?11th October 2005 under the theme ?Transcending Barriers?. There were many obstacles to overcome. For the Buddhist dalits, it is the first time to meet with international Buddhist fellows to discuss nothing other than Buddhism which is social engaged. Likewise, it is the fist time for many Buddhist friends to get to understand the situation of the dalits. The pre-conference workshop began with a keynote address by Dhammacari Lokamitra on Buddhist revival in India. He mentioned that the majority of people who took refuge in the Tripple Gems are the slum people, the poorest. He called for the responsibility to learn Buddhism. Only then we can see that the teaching of the Buddha is fraternity, liberty and equality. The Buddha only showed us the way to liberation, he never bestowed liberation to us. The mornings started with presentations from dalit Buddhists and others on the impact of Dr. Ambedkar on Buddhist communities in India and worldwide. In one presentation, we were reminded that conversion is in fact a process, not an event which ended in itself. It required a behaviour change not a symbolic action. It is an ongoing, radical, multi-dimensioned movement. Jonathan Watts gave an encouraging presentation on skillfully handling of identity. We learnt that everyone has both inferior and superior dimensions of identity. Only by cutting through the array of identity would we overcome all obstacles that bar our fraternity. Participants got into small groups in the afternoon. During small group discussions, it was identified that poverty, human rights violation, discrimination, inferiority, weak leadership, discord among dalit groups, and poor understanding of Buddhism were among barriers for the dalits to win over. 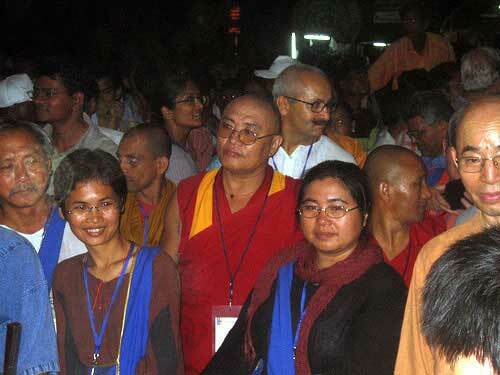 Of course it is important for other Buddhist fellows as well to break into understanding the struggle of the dalits. The role of Dr. Ambedkar and lesson learnt from his action were also analyzed during the discussion. He remained the hero and it is difficult to find anyone to replace him. Diksha Bhumi is the place where the first mass conversion of Dr. Ambedkar took place. It became the pilgrim?s destination for millions of dalit Buddhists all over India. Some even went there on foot. It is comparable to the mecca of the Muslim. The crowd surrounding the stupa of Dr. Ambedkar was so huge that we need the help of young men from Karate class of the Nagaloka Campus holding hand to form an aisle for us in the night of October 12th on the 49th anniversary of Dr. Ambedkar?s conversion to Buddhism We thanked them for their strength and patience against the pushing-and-pulling mass that was loudly shouting ?Jai Bhim!? all the time. The conference started with the blessing from many Buddhist leaders, including Ven. Pomnyun Sunim (South Korea), Ven. Samdong Rinpoche (exile Tibet), Ven Kuang Shin (Taiwan) and Sulak Sivaraksa (Siam). Then, the report from the last conference in Seoul, South Korea was presented, followed by short presentation of the Youth Ashram. We were very honoured to have two special speakers. Ven. Samdong Rinpoche, the prime minister of Tibetan in Exile gave the keynote address on Buddhism and Equality in the morning of 13th October. The next morning we had Sulak Sivaraksa?s Buddhist social action and skilful means with reference to social equality presentation. During the two days after the presentations, the participants join one of the discussion topics that interest them. Issues discussed included Discrimination and caste prejudice, Social and ethnic inequality (cases of Tibet, Burma, Bangladesh, India), Issues for Buddhist women, Leadership in Buddhist community, Education, Responses to manmade and natural calamity, etc. In addition to printed program, everywhere we saw people grouped themselves informally to carry on the discussion. New friendship was made also over chitchatting. The INEB youth group met together almost every nights to exchange their views on the topics that each of them joined. Their role as our hope for the future of INEB was recognized by the elders. Consequently, two representatives of the youth group were invited to join the Executive Committee. As believed in many parts of Asia, Naga is related to rain. Therefore the last three days of our stay in Nagpur ? the land of Naga ? was blessed by the rain, turning the beautiful Nagaloka into a muddy place. It worried us slightly since we wished to welcome H.H. the Dalai Lama in the best manner we can when he visited us on 15th and 16th October. Nevertheless, the muddy road seems to be nothing to H.H. the Dalai Lama. He still extended his compassion to us as ever. His Holiness was with us in the afternoon of the 15th October in the question and answer session. He impressed us by his brilliance, humour as well as deep spirituality. Some questions to him related to the small group discussion, e.g. the role of Buddhist women and female ordination and natural calamity issues. Some were general. The 2005 INEB Conference ended with the public teaching of H.H. the Dalai Lama. It attracted thousand of people. Many Tibetan traveled from afar particularly for this session. He even granted a special audience for them. The lecture of His Holiness was very significant. It is in Tibetan with English and Hindi simultaneous translation. He started with simple teachings and then went deeper and deeper into important texts such as Madhyamika which stunned many participants. A lot of us did not fully understand his lecture. Nevertheless, it was clear from the way he taught that to be Buddhist is not a lip service. We must study and practice. Likewise it is not only citing basic ones such as five precepts (although they can be contemplated in the sophisticated way, too), but there are a lot of profound teachings that all Buddhist should try their best to master. Some of us went on to visit the Caves Ajanta and Ellora after the conference. Although none of us from the secretariat office join the visit, we got some photos from friends showing how beautiful they are. Finally we would like to thank many people who make the conference possible. Dhammacari Lokamitra, Dhammacari Vivekratna, Dhammacari Maitreynath, Dhammacarini Ojogeeta, Mangesh, Priyadarshi, Prashant, young men from Karate club at Nagaloka, the cook, the students who served at meal times, the cleaners, the guards, the participants from far away countries, etc. With limit of space, all names cannot be mentioned. But one thing we can be sure of. It is the interdependence of many, many beings, we know and do not know, human and non human, that make our conference possible and successful, and we thank them, too.